Summer here is beautiful this year—cool mornings with warm and sunny afternoons. It’s hard to believe that summer is passing so quickly and that autumn will soon be upon us. Before my autumn schedule fills up I wanted to offer my one-day workshops that have been most popular: my HDR Bootcamp, and Digital Black & White Masterclass. You’ll also find that I’ve scheduled a new offering by popular demand, Photographing Flowers for Transparency. Details follow below. Note that we are offering a $175.00 early-bird special for registration in any of these three workshops by the end of August. After August 31, 2012, the normal tuition of $195 will apply. Description: In this intensive, full-day workshop, Harold will show you how to shoot for HDR, how to extend dynamic range using multi-RAW processing, using automated HDR software including Photomatix and Nik HDR Efex Pro, and hand HDR processing in Photoshop. In this workshop Harold reveals the secrets of HDR that you can’t learn anywhere else. With the HDR techniques taught in this workshop your photos will never be the same. Besides mastering HDR techniques, and most important of all, Harold will help you develop your own style of HDR photography. Registration: Tuition is $195.00 ($175.00 before August 31, 2012). Click here for information and registration. In addition, there will be time for selected individual portfolio reviews (registered participants will be given information about how to submit images for consideration). Description: Master photographer Harold Davis is well-known for his often imitated—but seldom equaled—digital images of luscious transparent and transulent flowers. It’s fun to apply textures to an existing image to create a new effect. In this context, a texture is simply a flat shot of paint on wood, or canvas, or something textural. It is applied over the original image in a Photoshop layer stack. This may seem counter-intuitive because people expect textural effects to belong to the background, as would be the case with a physical painting on canvas. In fact, some of my floral tapestries combine a scanned background of paper or canvas with textural overlays, so many variations are possible. Most often, I’ll experiment with different blending modes and opacity to add interest to my overlay textural effect—and I usually use more than one texture overlay per image. Note that I am using the term “overlay” to simply mean the texture layer is above the image layer on the Photoshop layer stack, and I am not referring to the Photoshop Overlay Blending Mode. I used exactly the same “recipe” with Venice of Cuba (shown above) and Tower in the Sun (below). The recipe consists of a series of specific textural layers applied at a given opacity and a variety of blending modes. About the images: While Tower in the Sun appears to depict an exotic location, it was in fact shot close to my home. The tower is the Ferry Building in San Francisco. I substantially underexposed the original image at 1/2000 of a second, f/16, and ISO 200 so that the disc of the setting sun would be rendered. Venice of Cuba shows a river in Matanzas, Cuba. Matanzas is sometimes called the “Venice of Cuba”—hence the title of this interpretation. My thought in creating the “recipe” was to try for an effect like a Canaletto painting. You can view the original photo that the texturized version was made from on my blog. The other day I was lucky enough to get an opportunity to photograph a Falcon Motorcycle. These motorcycles are one-of-a-kind completely handmade works of art. As I particularly enjoy photographing machinery it was a real treat getting to photograph a machine that had been so carefully and artfully constructed. To capture the subtle shapes and forms of the motorcycle’s engine it will surprise no one who reads my blog to learn that I used High Dynamic Range (HDR) techniques. This image was created from seven exposures. Each exposure was shot at f/11 and ISO 200. I used a tripod, and manually bracketed the shutter speeds in a range from two seconds to 1/200 of a second. In post production I combined the exposures using Nik Software’s HDR Efex Pro 2 and hand-layering in Photoshop. My original thought had been to produce a monochromatic final image, but when I saw the results in color I decided the color version looked pretty good too! I converted the color version to black and white using Nik Silver Efex 2, Photoshop Black & White adjustment layers, and a monochromatic HDR version processed from the original seven files. These images will make stunning prints I think on Moab’s wonderful pearlized metallic Slickrock paper. By the way, I’ve been asked a number of times recently why I often choose to shoot my HDR sequences using manual shutter speed bracketing rather than in-camera auto bracketing (which at first blush would seem easier). The answer, as I explain on page 76 of Creating HDR Photos, is that auto bracketing programs do not in fact capture enough extended dynamic range. So if you want to create HDR multi-shot imagery like mine you, too, will need to bracket manually. I plan to write a future blog story on the mechanics of keeping the camera absolutely still while one manually brackets. 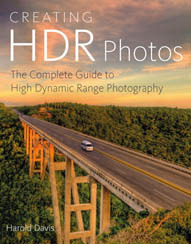 Briefly noted: My new book Creating HDR Photos: The Complete Guide to High Dynamic Range Photography is now shipping on Amazon. We are very excited about this book—you won’t find garish HDR in my book, you will find gentle and painterly HDR as well as information that shows you how to blend HDR exposures by hand, and puts HDR in the historical context of photography. 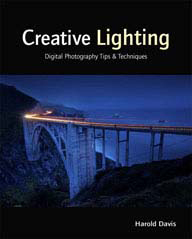 Here’s the book description from Amazon: Since the days of the first photographs, artists have used various techniques to extend the range of lights and darks in their photos. Photographic masters such as Ansel Adams and Edward Weston spent countless hours burning and dodging their prints to create images with extended dynamic range. With the advent of digital photography, new horizons in extending dynamic range are possible. HDR techniques now make it easy to extend the dynamic range of an image well beyond the capability of the human eye. In Creating HDR Photos, bestselling author Harold Davis covers the complete HDR workflow, from choosing the subjects that work best for HDR through processing RAW files to unlock the dynamic power of HDR. You’ll learn how to photograph multiple exposures and blend them into a single HDR image using various software programs. Best of all, you will find out how to control the style of your HDR images, from subtle to hyper-real, using a range of photographic and post-processing techniques. Packed with stunning image examples, Creating HDR Photos brings this essential digital technique within every photographer’s grasp. Click here to order Creating HDR Photos: The Complete Guide to High Dynamic Range Photography from Amazon. This time of year there are a great many dahlias to choose from, and it is great fun arranging and assembling them. I shot this image of purple dahlias intending it to look a bit like a botanical illustration as well as a photo—and thus to accompany Peonies mon amour, Red Poppies, Easter Lilies, Dahlias, and Gaillardia, and White Irises (among others!). An abandoned cement field in West Oakland near the docks was filled with large, rusting metal pipes, maybe ten feet in diameter. What was their original purpose? Why were they left behind? Who knows. The vast area was fenced, but it had obviously been entered many times—getting in was no problem. Once inside I felt the need to stay alert regarding my surroundings, although as far as I could tell I shared the scene only with trash, weeds, wall art, and the gray sky of a misty day. The damp, overcast weather helped saturate the colors you see in this image. As I often do these days in the field, I manually bracketed for HDR. Usually, this means about a 10 EV exposure range—plus, of course, whatever one can tease out of the RAW files. Specifically, for this image I shot ten exposures ranging from 1/200 of a second at the darkest end to 4 seconds at the lightest end. Each exposure was shot at 130mm, f/36, and ISO 200, using a tripod. It turns out that this was definitely too much information! Running the combined exposures through HDR processing led to an average looking image that showed the interior of the pipes along with assorted booze bottles and trash. This was definitely not the look I wanted to achieve because I knew things would be much more dramatic with a contrast range between the blackness of the pipe interior and the riotous color of the graffiti on the wall behind. So I reprocessed the image, mostly using a single exposure, to enhance the high contrast drama, adding a little color to the central paintings using a low opacity version rendered by Nik HDR Efex Pro 2. If you look carefully, you can still see an old booze bottle caught between the two pipes. I could have retouched this out, but decided to leave the bottle in the image as a reminder of the authentic environment this image was made in. The moral, of course, is that there is no real problem overshooting in the field. If I don’t need all the information, I can just discard it at the processing stage. Better to have it in case I need it, and end up not using it, than to regret undershooting. As experienced photographers know, mostly you can’t go back because things are never the same twice. In the great seafaring Aubrey-Maturin novels by Patrick O’Brian, the bad guys often get their just comeuppance using a ruse de guerre that in hindsight should have been obvious. Admiral Ramage, the protagonist of a somewhat less literary but still entertaining eponymous naval series by Dudley Pope, puts it this way: we expect to see the obvious, therefore the obvious is what we do see, even when there is something else going on. The photographer’s job is to see beyond the obvious. At the very least, seeing beyond the obvious means being acutely aware of one’s environment. Visual explorations help, as does looking up, down, and to the sides. The view straight ahead is not the only one! Ignore preconceptions and prior expectations whenever possible. In this spirit, when I recently visited San Francisco’s Grace Cathedral with my camera, the view that most interested me was straight up, with the exposed structure supporting the ceiling looking for all the world like the skeleton of some large beast. My Photograph Paris in the Autumn with Harold Davis workshop is limited to a small group of six photographers, guaranteeing you a great deal of individual attention.For learning, the small group experience simply can’t be beaten, and the individual attention also includes a unique opportunity to spend 90 minutes of one-on-one time with me at a venue or on a topic of your choice. For instance, you can pick a Paris monument to shoot with me, we can discuss how best to shift your vision, or you can learn my approach to the ins-and-outs of HDR processing. The sky is the limit. If you really want to take your photography to the next level this is the very best way to do it. A small group is the best way to learn and every photographer who has spent one-on-one time with me has told me they have seen incredible results in their photography. “When I’ve shot with Harold my knowledge expands in a seemingly natural way. At the same time I am much more confident in my photographic journey. If you have ever found yourself thinking, ‘I wish I could meet that artist in person and ask ….’ you now have that opportunity.”—Mike W.
The workshop will run October 14-21, 2012, and space is limited. To avoid disappointment please register by July 31, 2012. More information and registration: PDF flyer; workshop info; Paris itinerary; online registration. You can also register by calling 800.747.2255 and asking for Sarah Loan at Ext 120 (M-F, 9AM-5PM Central time). My Slot Canyon image was created using hand-HDR layering from four exposures, as I explain in my original blog posting about the color version and in my forthcoming book Creating HDR Photos: The Complete Guide to High Dynamic Range Photography. The color version is reproduced on page 67 on the section on using a tripod. The placement of the photo in the section of my book discussing tripod tips and techniques is apt, because in an environment like a slot canyon finding a way to keep camera and tripod stable through a sequence of shots—and keeping one’s gear sand free—is a very real issue. It is easy to getting bogged down in the physics and physicality—the tyranny of the world of “things”—and forget to look for the ethereal magic than can make a photographic composition really sing. With Slot Canyon the play of light coming down the narrow cleft in the rocks was pretty exciting. So far so good. But I kept looking for something more, something to elevate and contrast with the textures in the stone. When I spotted the tumbleweed bush on the right, momentarily lit by a sunbeam, I knew I had found my key. I was lucky to be able to get set up and make my four exposures before the light changed. If you are interested, here’s the exposure data: 50mm, 4 exposures at shutter speeds 0.8 of a second, 1.3 seconds, 2.5 seconds, and 4 seconds, each exposure at f/29 and ISO 200, tripod mounted. I am honored that my image Distant Night Storm in the Patriarch Grove has been shortlisted in the Royal Observatory Greenwich Astronomy Photographer of the Year 2012 competition. Click here to read my original blog posting about how I made this image. I’ve been asked a number of times about the process behind the making of my images of the Basilica Mission Dolores, shown below and in Looking for Light. This is a monochromatic style that I’ve developed intentionally that is based upon High Dynamic Range (HDR) shooting techniques. For other examples of this presentation style, which is intended to partially evoke an old-fashioned etching look see my Agaves and Choosing the Path. You’ll find some hints about how I do this below. The most important part of this process is the HDR shooting technique. It also helps to start my photography at the very beginning with a final image pre-visualized in black and white—even though a RAW capture by definition includes all the color information. As I explain in Creating HDR Photos: The Complete Guide to High Dynamic Range Photography, when I shoot for HDR I am careful to use a sturdy tripod. I find that manually bracketing the shutter speed works best. The sequence of seven RAW captures I made for this image are shown below in Adobe Bridge. All exposures were using a 12mm wide-angle focal length at f/9 and ISO 200. My shutter speeds ranged from 1/8 of a second (the darkest) to 20 seconds (the lightest). Because I knew that my ultimate destination was black & white, one of my first steps was to run the seven captures through Nik HDR Efex Pro, choosing the Soft Mono HDR preset. This is preset converts a bracketed HDR set of captures to monochromatic by setting the saturation slider to 0%. Results are shown below. Having processed the files this way, I put the Nik HDR monochrome version aside for use at a later stage in the process. I created the initial color version, shown below, by layering dark and light versions together in Photoshop. The basic scheme was to use a fairly light exposure (#2881, at 8 seconds) as the background, then selectively paste a lighter exposure over it for the darker areas (#2882, at 20 seconds). Areas that were too bright—such as the windows—were controlled with a darker exposure (#2878, at 3/5 of a second). Note: you can see the different exposures in the figure showing Adobe Bridge above. The initial color blend is shown below. Rarely do I construct one of these images without finding flaws that need to be retouched. In this case, I decided to remove a woman sitting in a pew, a devotional man at a niche, a fire extinguisher, and a cut-off statue. The layers panel with each of these corrections is shown below and to the right. At any normal viewing size one can hardly see these issues, but on my large monitor when I zoomed in they were clear. It’s a funny thing—even though some issues are hardly noticeable at a conscious level, I do find they make a significant difference in terms of the viewers overall impression of an image once they are cleaned up. Viewers may not be able to identify why they respond to one of my images, but it is partly because I’ve taken the time to really clean the image up. It’s worth going to the trouble involved, because half measures do not avail us! Let’s face it, this kind of post-production work is fairly arduous. If I am going to take the time to do it in the first place, I’d really like to get everything right that I can. And, in case you are wondering, yes, I also had to retouch these issues in the reserved monochromatic version to conform to the color version. With the color version complete and retouched, and a monochromatic HDR version reserved, I am ready to do the overall monochromatic conversion. This involves a layer stack with different monochromatic versions combined at varying intensities using several Blending Modes—Normal, Luminosity, Screen, and Soft Light. In the case of the Basilica, I started at the bottom of my conversion layer stack with the default monochromatic conversion from Nik Software’s Silver Efex 2. I layered on top of it the reserved HDR mono version selectively applied via a layer mask, and a second mono HDR layer applied overall using the Luminosity Blending Mode at 20% opacity. To finish the conversion I added a layer to add texture and softness. I created this layer using the Topaz Wood Carving filter applied to the color version. This filter is found in the Topaz Simplify plugin, and my results are shown below. Flattening the monochromatic conversion layers led to the finished image shown at the beginning of this story. Effective shooting for HDR is pretty straightforward if you have a good tripod, some patience, and use manual exposure controls to bracket the entire dynamic range of the scene you are shooting. For a full explanation of the technique please see Creating HDR Photos. Crafting a unique and subtle look in post-production from an HDR shoot is not always straightforward. It helps to know where you might be going by pre-visualizing the results at the beginning of the process. Even when I have some idea of the benchmark steps along the way, there is usually no firm recipe for my HDR conversions, and I do quite a bit of experimentation as I go along. So you should regard the steps I’ve explained in this story as waypoints on your conversion journey—subject to your own creative ideas, and not fixed in stone. I’ve been creating a number of horizontal floral panoramics, for example my Star Magnolia Panorama and Floral Tapestries, but this image, Peonies and Matilija Poppies, is my first high resolution vertical floral pieced together from more than one frame. The horizontal format is much more typical than a vertical format when it comes to panoramas. Maybe this is because panning from left to right comes naturally, and up to down less so. Also maybe there aren’t that many spaces that lend themselves to a really tall vertical print. I shot the image in two frames straight down on a lightbox. The lighting comes from behind via the lightbox, and from in front using controlled natural lights and reflectors. Each frame consists of ten exposures, with each exposure shot using a 40mm macro lens at f/14 and ISO 100. Shutter speeds ranged from 1/30 of a second for the darkest image to 5 seconds for the brightest image. I combined the twenty exposures that went into this vertical panorama by first layering together each frame. I started with the brightest (5 second) exposure, and used layers, layer masks, and the Brush Tool in Photoshop to paint details in—with some assistance from a layer constructed using Nik’s HDR Efex Photoshop plugin. Once the top and the bottom of Peonies and Matilija Poppies had been combined I stitched the two panels together to construct the final image. I then placed the image in Photoshop on a scanned paper background, with some added texture on top of the final image. I shot this image at the same time as Peonies mon amour, and am only now getting around to processing it. Like Peonies mon amour, I think Peonies and Matilija Poppies will make a great print on Moenkopi Unryu Washi rice paper. Please let me know what you think of this image. Click on the image or here to view it larger (opens in a second window). Driving across the great central valley of California on my way to Yosemite, a fierce wind kicked up dust and limited my visibility. Then I noticed that the hazy light was selectively clearing with sunshine coming through. The light was definitely odd, but interesting and varied. A high wind was whistling the dust all around me. I stopped at a long aisle of trees. I liked the painterly effect of the dusty light in the tress beside the road, and the distant perspective looking down the trees. Without thinking too much about exposures or anything else I pulled out my camera, and snapped a photo. The next minute the dust had closed in again and the light was gone. Exposure data: 62mm, 1/160 of a second at f/11 and ISO 200, hand held.